Soup cup only no saucer. Two available. A touch of crazing and tiny nick to the foot of one and two very very small manufacturing chips to the rim of the other which have been glazed over. Blue printed backstamp. Small dessert dish with rim. Backstamp: Adams Member of the Wedgwood Group Real English Ironstone etc. Excellent condition. Various ages therefore depth of colour may vary. Minor signs of wear. These are such a useful size. Great for cereals or soup but also ideal for that slice of apple pie! Excellent condition. Ironstone. A little minor surface scratching otherwise excellent condition. Blue printed backstamp: Real English Ironstone Adams Made in England Blue Butterfly. In the pale blue version of Adams classic design, with white gadroon rim. Good condition from a dinner service dating from 1914. Small dessert or nibbles bowl. Backstamp: Reg. No. 623294 This pattern was introduced by William Adams in 1780 being a copy of a Chinese pattern and one of the first of its style produced in English pottery. Wm Adams. There is a little wear around the rim and on the back and a tiny area of minor discolouration to the face. Backstamp: Reg. No. 623294 This pattern was introduced by William Adams in 1780 being a copy of a Chinese pattern and one of the first of its style produced in English pottery Wm Adams. Light crazing otherwise excellent condition. This is the large saucer that accompanies the two handled soup or boullion cup. Excellent condition. This is the round fruit saucer, with the wide slightly indented stone rim. Usual blue printed backstamp with impressed date mark for 1934. Lovely large rimmed soup or pasta plate. Backstamp: Reg. No. 623294 This pattern was introduced by William Adams in 1780 being a copy of a Chinese pattern and one of the first of its style produced in English pottery. Wm Adams. The pattern is quite blurred in the curve of the plate and there is a little minor wear to the inner rim, otherwise excellent condition. Soup or boullion two handled cup with two different pattern cartouches either side. A tiny tiny nick and small minor glazing fault to the foot of the cup, both barely visible, otherwise ecellent condition. The cup would originally have had a cover. The original version of William Adam's famous design, which the Adams factory later reproduced in the 20th Century. Backstamp: Impressed Adams. Some surface scratching and wear to the outer rim, overall excellent condition. Rimmed dessert dish. Depth of blue varies a little from dish to dish. Black printed backstamp. Pretty two handled cup and saucer. Small vignette of pattern inside to the base with floral border around the inside rim. Depth of colour may vary a little from piece to piece. Blue and black printed backstamp. Small soup plate, doubles as a good dish for dessert. Depth of blue varies from plate to plate a little. Black printed backstamp. This is an early example in this design. One has a restored rim chip. Some signs of use. Typical blue printed backstamp Juliet over crown with Adams, Estd 1657, England beneath. One has an impressed date stamp for 1931. Pretty little fruit saucers impressed with date for 1932. Fabulous large rimmed soup plates. Backstamp: Ironstone Shanghai Adams Tunstall England. Excellent condition. Depth of colour varies a little from plate to plate. Backstamp: Real English Ironstone Adams Made in England Established 1657 Sharon. Excellent condition. Printed in a rather dark slightly steely blue. This plate is impressed with the date for July 1927. There is some utensil scratching to the surface and minor signs of age to the back of the plate. Fabulous plate with gorgeous floral border. Backstamp: Ashworth Bros Hanley and impressed M7M. Light crazing otherwise excellent condition. Also known as Number 6 pattern and made by Davenport. Lovely bird and floral pattern with added colour and an ochre rim. Backstamp: Ashworth Bros Hanley England and in script pattern no. B9461. Ochre rim very worn and one or two printing blemishes otherwise excellent condition with no actual signs of use to the face of the plate. Depth of colour varies a little from plate to plate. Ironstone china by G L Ashworth & Bros, owners of Masons. 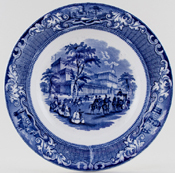 The Oriental flower and fence design on this plate started life as Hicks & Meigh's No 21 pattern and may have been acquired eventually by Ashworths. 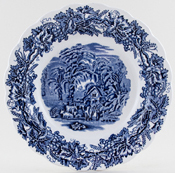 Wedgwood also produced this design under pattern number 1156. No maker'sbackstamp, although impressed is W8R. Excellent condition, with a little blurring of the transfer. Barker Brothers, Royal Tudor Ware. Large deep plate with rim. There is a firing crack to the plate, rather well concealed thanks to the density of the pattern. Lovely piece for display only. Barker Bros, Royal Tudor Ware. Excellent condition. Small rimmed dessert dish. Backstamp: Royal Tudor Ware Made in England. Small dish with fluted rim. There is a small area underneath which is unglazed and has a small blemish otherwise excellent. Dessert or small soup plate with rim. Rimmed soup plate in this lovely pattern with wheat and grapevine border. Backstamp: Bridge of Lucano. A little surface scratching with some wear and loss of glaze to the outer rim and on the back under the rim. Made by J & MP Bell & Co. of Glasgow, Scotland. This traditional "romantic" type scene is printed in a dark vibrant blue. Backstamp: A bell and J & M P B & Co, Trade Mark Agra. Glaze is crazed, three prominent stilt marks on the front border and some surplus blue on the back, but otherwise fine. 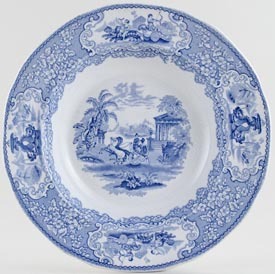 The pattern on this plate was introduced at the time of the Great Exhibition of 1851. The Crystal Palace was designed by Joseph Paxton and built in Hyde Park, London, for the Great Exhibition of 1851-2. Subsequently it was dismantled and re-erected in South London. Backstamp: Crystal Palace J & MPB & Co. A little blue spotting here and there otherwise excellent condition. 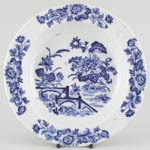 Fabulous scene to the centre of this soup plate with rural and sea scape vignettes to the border. Backstamp: Going to Market J & M P B & Co. A few minor blemishes to the rim otherwise excellent condition. The print on this plate is in sepia, with hints of black, grey and brown. Unusual and very attractive. The pattern is Bell's famous, rarely seen Royal Conservatory, which is beautifully engraved and printed. We believe the pattern may be more correctly named simply Conservatory and the Royal may have been intended as a series name or the type of body. Impressed garter backstamp, with J&MPB&Co and Crown and ROYAL. Printed cartouche with similar, but Prince of Wales feathers instead of Crown, plus the words ROYAL and CONSERVATORY in different typefaces. A Registration lozenge for 7 April 1856. The rim has several nicks and minor chips, but otherwise bright and clean. J & MP Bell of Glasgow. Shallow plate. Light crazing otherwise excellent condition. Blue printed eagle mark and impressed bell. J & MP Bell of Glasgow. Backstamp: Triumphal Car J & MP B & Co and impressed Crown J & MP B Royal. Has a small brown spot in the curve of the plate otherwise excellent condition. J & MP Bell of Glasgow. Slightly deeper style of plate. Backstamp: Blue printed eagle Triumphal Car J & MPB & Co and impressed bell Crazed with some light associated discolouration. Fabulous large wavy rim plate. Backstamp: Asaitic Pheasants B & D. Wear with some loss of glaze to the outer rim, otherwise excellent condition. Large soup plate with wavy rim. Backstamp: Royal Cottage B & T and impressed Stone Ware B & T. Light all over crazing otherwise excellent condition. Two handled cup in excellent condition. Two handled cup with saucer printed in a light steely blue. Backstamp: Booths Made in England British Scenery A8024. Saucer has light crazing and cup has a little minor wear underneath and the occasional minor blemish. Wonderful soup or pasta plates printed in a soft steely blue. Backstamp: British Scenery Booths Silicon China Made in England and impressed date for 1946. Excellent condition. This is a fabulous large shallow bowl resembling an oversized rimmed soup plate! A wonderful trap vine and what border surrounds the central rural view and all printed in a slightly steely blue. Backstamp: British Scenery Booths Silicon China Made in England, impressed Booths and date for 1931. Some surface scratching otherwise excellent condition. Tiny tiny nick to rim. With gilt and wavy rim. Gilt rim. Majestic shape with wavy rim. Traditional broad rim soup plates. 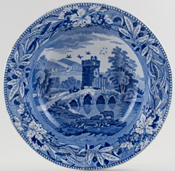 Blue printed with gilt rim which is worn. Plain round rim. Plain rim soup plates with 1.5 ins border. Gilt line decoration to rim. Some wear to gilt. Blue printed Booths over crown, with Silicon China and Made in England beneath. Impressed date mark for 1920s. Traditional broad rim soup plate great for pasta. 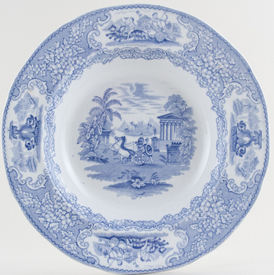 Blue printed with gilt rim which is worn. Plain round rim.